Dell DAS Storage that provides scalable, yet cost-effective storage capacity expansion for business, remote offices, or datacenters with growing applications! Dell SAN Storage (both SAS and FC arrays) an excellent choice for a small to medium size business or enterprise remote sites in need of cost-effective, easily scalable, and advanced functionality shared storage! 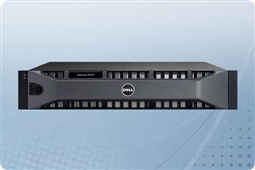 Dell EqualLogic SAN Storage the intelligent storage solution choice for businesses of all sizes seeking power, scalability, and the most features from Dell Storage! Aventis Systems offers a 3-year comprehensive warranty on all of our storage products, regardless of condition. If you’re looking for more in-depth coverage, you have the option to upgrade to our extended 6-year warranty or onsite service support. Choose from our direct attached and network attached Dell storage options that suit any big data storage requirement and budget for SMBs! We also offer a wide selection of HP storage arrays. Not sure what type of storage is best for your business continuity and budget (DAS, NAS, or SAN)? Check out our Survival Guide: Avoiding A Data Apocalypse today! 20.4TB (17 x 1.2TB) 10K 6Gb/s SAS 2.5"